BERLIN, Germany (CNN) -- Talks on the future of German carmaker Opel failed to reach a resolution despite stretching into the early hours of Thursday, officials said. 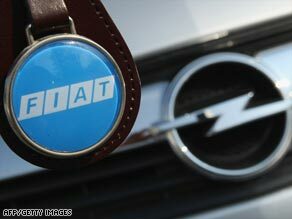 Italian carmaker Fiat is one of two parties in talks with the German government to purchase Opel. The German government managed to whittle the number of potential bidders for Opel from four to two -- Italian car giant Fiat and Canadian-Austrian supplier Magna. But the talks, which were also about bridge financing to keep Opel running while an investor is sought, were scuppered by a last-minute request from Opel's parent company, General Motors, for an extra $417 million in short-term financing for Opel, German ministers said. The German government said it doesn't know where to find that amount of money on such short notice. It has asked Fiat and Magna to rework their bids so they can come up with the funding. Magna said it may be able to offer that amount as long as the German government guarantees the money can be recovered. "We have lots of cash. We've got no problem," Magna Chairman Frank Stronach told reporters Thursday. But, he added, "if we say we arrive at agreement and the United States breaks their agreement and General Motors breaks their agreement, then it's only fair to say you, the German government, have got to help us recover the money. It's only fair." U.S. investment firm Ripplewood dropped out of the bidding process, and a fourth bidder, Beijing Automotive Industry Holding, entered too late to be considered, German officials said. Any bidder for Opel would also be buying GM's European operations. That means the outcome of the talks would have a direct effect on GM's other operations across the continent, including Vauxhall in Britain. There are some 56,000 workers for General Motors in Europe, and about 25,000 Opel workers in Germany. Both bidders have mentioned cutting 10,000 jobs across Europe, without about 2,000 jobs at stake in Germany. The reason the company's fate is currently being decided in Germany is because the German government has offered billions in loan guarantees to any potential investor -- more than any other European government has offered. "The UK government must now finish the job it's been working on. That means being at the meeting table when the final decisions for the ownership of GM Europe are made," said Unite's joint general secretary, Tony Woodley. "It's crucial that we don't allow any other government to drive through a plan which reflects only one country's interests." British Business Secretary Peter Mandelson said Thursday he has secured a commitment from both Fiat and Magna that any bid would protect Vauxhall operations in Britain. He said any fears for British jobs are unfounded. The talks that ended early Thursday involve the German government and representatives from the four local German governments where Opel has plants, along with the investors, General Motors, and GM Europe. Talks are expected to continue Friday. If the government fails to find an investor who can provide the bridge loan, Opel and GM Europe may face insolvency. Mandelson said that once the talks have concluded in Germany, there will be a detailed discussion about the new owner's plans for the various GM divisions and plants in Europe. Each bidder has different ideas for the future of GM Europe, Mandelson told Sky News. Fiat plans to take over the company and separate itself from General Motors, while Magna would allow GM to retain a stake in the new company and bring in Russian investment. In the meantime, Mandelson said, Vauxhall is not facing the cash shortfall that Opel is, so the British government is not being asked to provide short-term financing for the British brand. "As the restructuring of the company takes place under its new owners, the British government along with other European governments will be asked to underwrite, to underpin, that restructuring financially," Mandelson said. "I have already indicated both to Fiat and Magna the British government's preparedness to undertake that financial commitment. But we're not going to start negotiating how much, on what scale or when until we have the detailed business plans from whichever bidder is successful in gaining ownership of General Motors in Europe." CNN's Diana Magnay contributed to this report from the Opel plant in Eisenach, Germany.